March 3, 2017, ©. Leeham Co: We will now go through how airline turbofans are maintained. First, we will describe the typical work which is performed, then look into the markets for engine maintenance. In the markets for engine maintenance, we will look at who the players are, how they are related to the engine OEMs and why the market dynamics are very different between engines for single-aisle aircraft and wide-bodies. Figure 1. Principal picture of a direct drive turbofan. Source: GasTurb. The engine maintenance market calls the typical maintenance operations that it performs the workscopes. We will focus on the standard types which are triggered by either EGT margin or mechanical deterioration, together with Life Limited Parts (LLP) limits. The typical workscopes on single-aisle engines is LLP limits since new is one or a maximum two performance restoration shop visits before the trigger for taking the engine off wing. New engines have larger EGT limits than engines after a performance restoration. Dependent on the extent of the workscope, 60% to 80% of the original EGT margin is regained. 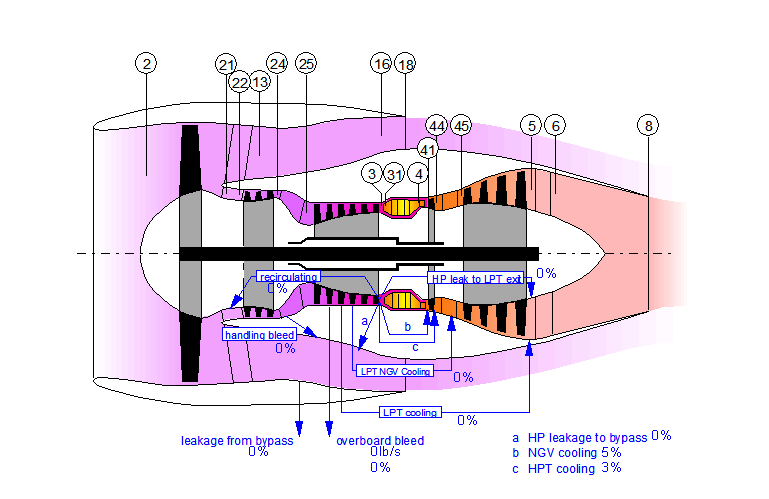 A less ambitious workscope for EGT margin restoration would be only a high pressure turbine restoration, with either exchange or repair of worn or deteriorated parts. Those parts could be turbine blades, seals, or stator parts. A more ambitious workscope would include low pressure turbine jobs and include compressor section repairs. This can include exchanging blades, seals or restoring/adjusting variable guide vane operation. Typically, the first visit has a lighter workscope and any second visit a more elaborate content. Costs for restoration visits divide between workscope man hours, parts costs and any repair costs for parts that can be repaired. Such repairs are often done by specialist shops which have the tools of, for example, restoration of coatings on turbine parts. Typical times on wing for high rated variants of the engines would be around 7,000 to 10,000 cycles for historical engines, whereas the latest specifications could stay on wing another 50% cycles. It would depend on the Engine Flight Hour (EFH) to Engine Flight Cycle (EFC) ratio and the derate the operations would allow. Lower rates engines, especially later specification ones, would stay on wing until the first LLP limit would be reached. The CFM56-7 engine for the Boeing 737NG has high EGT margins from delivery and would typically stay on wing until the first LLP limit triggers a shop visit. Typical costs for a performance restoration visit could be $300,000 for a light restoration of the -5 series, with up to the double for a more thorough visit. LLP limits depend on the different LLP groups. A CFM56 engine has 18 different LLP groups, whereas the IAE V2500 engine has 25 groups. The V2500 has one LLP limit for all the groups, 20,000 flight cycles. The latest specification CFM56 has cold section limits (fan, booster) of 30,000 cycles, compressor limits of 25,000 and hot section limits of 20,000. Older specification engines typically had lower limits for hot parts, like CFM56-A variants or -5B or -7 variants before “Tech Insertion” specification on components allowed limits to be raised. A visit where LLP parts are exchanged would mean a more thorough dismantling of the engine, and the LLP stacks are expensive. A high pressure turbine LLP exchange costs easily $0.5m, the fan/booster parts $0.5m-$0.7m and the whole engine stack is priced north of $3m. Operators divide the LLP stack prices and limits so they can see the LLP price per flight cycle for the engine. Typically the cost is around $150 per cycle. Together with shop work-hour costs the visit for an LLP time restoration can be close to $3.5 to $4m. Does this mean budget airlines who make savings with reduced turnaround time and more frequency would lose money later depending on this ratio? Im assuming a lower ratio would reduce time on wing. I.e. more cycles. Im wondering if a ratio that is too low would start to negate revenue in the long term due to increased future maintenance costs. a high frequence to flight hour ratio will lower engine life. You typically have to replace parts before their LLP life is up. Engine maintenance is around 2/3 of total aircraft maintenance costs, but these are only ~5% of total Direct Operating costs for a single aisle. If these costs increase or decrease it varies the total operating costs with a fraction of a percent. I’ve got 2 questions Bjorn. First, how does the cost of going the service driven “power by the hour” route compare with the ownership route (eg with regard to the US$150 per cycle)? Second, if a significant operator chooses to go with ownership and likes the look of a specific model but for only limited operations, what tends to be the minimum viable fleet size for any such given type, from the engine perspective? I’ve been travelling the last week, therefore the late answers. Ownership is generally cheaper as you take on the adiministration and risk of the caring for the engine. Question is how you value this. An airline with a large fleet of an engine type can average the risk of a few individuals having unforseen problems. As an engine OEM can do the same it can be attractive for an airline to let the OEM take the risk if he has small subfleets. As I have described there are in general no specific models of engines, the variants are the same engine with different rate plugs. An example with a small number of a specific model would be where a CFM56 based A320 series airline would choose the V2500 for the A321. This is rather common as the v2500 has characteristics which suit the A321. The subfleet sizes can be small, down to 10 aircraft. Bjorn, just so I’ve got this down correctly, it’s perfectly “fine” (in many cases?) to put a jet turbine back into airline service at a 60% to 80% of original EGT limit– after onwing maintenance ? 60% (in some cases), really? Can you give a specific engine type at 60%? Thanks. the earlier variants of the CFM56 and V2500 had ~60% restoration of EGT margin for smaller workscopes. As improvements were introduced as experience with the engines grew the lowest restoration margin has increased to ~70%. I can see clearly in this story why we had such a boom in short haul plane orders. When the astronomic fuel prices pushed the economic life of your average 737/320 down from over 20 years to say 15 years or less meant new orders kept the total in use fleet the same or higher. The costs of the engine maintenance had wiped out the residual value of the entire plane once you are at 15 years or so when looking and engine overhaul along with airframe D check. A new plane not only gave a new engine with its maintenance holiday but it saved on the fuel bills as well. could you describe the workscope of the EPR (Engine Performance Restoration). The ones I was referring to was light ones done as first visit for new engines. This was done pretty early before the engines got different tech inserts, making them go close to the LLP cycle times. Then any EPR will be more ambitious. Hi Bjorn, Typically an EPR in a lease would be defined as a full disassembly and repair of at least the core (HPT, combustor etc) and if required by the OEM guidelines of the other sections. This will be very often accompanied with a requirement to provide enough capacity / margin to allow operating for at least another 5-8k cycles to the next EPR. Core module LLPs would be replaced only during an EPR as they entail complete dissasembly of the Core section anyway. Thanks Lukk for contributing. I note your points. I knew EPR for later engine standards was more thorough, now I have a value for the cost. What would be the typical EFC for the highest rated variant of these engines before you either put them on a smaller aircraft or do an EPR? I’d have to ask colleagues in the tech department but this would differ very significantly between various operators depending on the environment and maintenance standard of the operator so perhaps you could provide a specific scenario? However, on an A321 with IAE engines in a decent environment you could achieve 10-12k FC on a ratio of 2.5 FH / FC or higher. The longest ever interval on a CFM56 engine was clocked by TUI – it was 50k FH meaning it must have been flown on a route of 2.5 hours or higher as the core LLP limit is set to 20k. But this was on an 737-800 so not the highest rated engine. Any question please drop me a line on the email.